The Pakistan Army initiated indiscriminate firing of small arms, automatics and mortars in the Krishnagati sector of Poonch district. The firing in the Krishnagati sector began around 6 am and the Indian troops retaliated effectively. Pakistani troops violated the ceasefire four times along the Line of Control (LoC) in Poonch, Rajouri and Baramulla districts of Jammu and Kashmir today, injuring three Army jawans, officials said. According to Army sources, the Pakistani troops opened indiscriminate fire at Indian positions at Baaz Post in Uri in Baramulla district at around 4 pm. Three soldiers suffered bullet injuries in the firing and were admitted to the 92 Base Hospital of the Army in Srinagar,they said. Pakistani troops also violated the ceasefire agreement thrice in Rajouri and Poonch districts. However, there was no casualty in these violations. “Pakistani Army has resorted to firing and shelling along the LoC in Nowshera sector of Rajouri district,” a senior district official told PTI. Four areas along the LoC — Kalal, Khori, Manpur and Ganiah — were targeted by the Pakistani troops this evening,he said. In the morning, the Pakistan Army initiated indiscriminate firing of small arms, automatics and mortars in the Krishnagati sector of Poonch district. The firing in the Krishnagati sector began around 6 am and the Indian troops retaliated effectively, a defence spokesman said, adding that the exchange of fire stopped around 12.30 pm. There was also a brief ceasefire violation by the Pakistani troops along the LoC in Mankote sector of Poonch district this morning, a police officer said. Poonch district has recorded five instances of ceasefire violation by Pakistan since yesterday. On Saturday, a Junior Commissioned Officer (JCO) of the Indian Army and a civilian woman were killed in separate cases of ceasefire violation by Pakistan in Poonch. 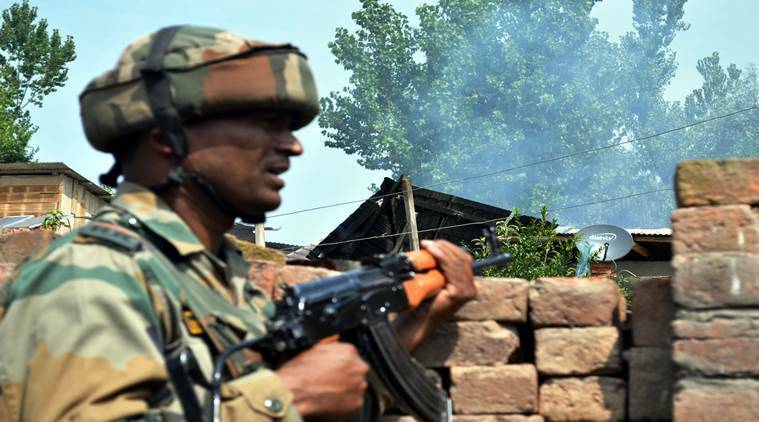 Naib Sudebar Jagram Singh Tomar (42), a resident of Madhya Pradesh, was killed in firing by the Pakistani troops in the Krishnagati sector, while 40-year-old woman Raqia Biwas killed when mortar shells fired from across the border exploded near her house in Gohlad Kalran village. On August 8, Sepoy Pawan Singh Sugra (21) lost his life in unprovoked Pakistani firing in the Krishnagati sector. Till August 1 this year, there have been 285 instances of ceasefire violation by the Pakistani forces. In 2016, the number was significantly less at 228.